Lukáš Hejlík was born in 1980, in Cítoliby, near Louny. He studied at the Business Academy in Louny. 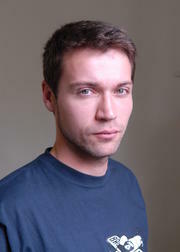 In 2002, he graduated from the Vyšší odborné škole herecké (Higher Specialised School of Acting) in Prague under the leadership of Jan Hartl and Eva Hodinová, where he also worked together with directors Helena Glancová and Otomar Krejča. After a year-long engagement at the South Bohemian Theatre in České Budějovice, he moved to the South Moravian metropolis in 2004, where he became a member of the drama ensemble of Brno City Theatre. He also often acted as a guest at the Silesian Theatre in Opava. He has performed in more than twenty interesting roles, e.g. Ariel (The Tempest), Treplev (Seagull), Francek (Maryša), Laca (Jenufa), Emil (Straw Hat), Mortimer (Mary Stuart), Isidoro (The Squabbles at Chioggia), Jožko (Help) and recently also Lukáš (Art), Brick ( Cat on a Hot Tin Roof) and Pierre Brochant (The Dinner Game). His full-length film debut was in Crash Road by Kryštof Hanzlík, 2007. He also appeared in the sequel to the series Dobrá čtvrť (Good Neighbourhood). On TV Prima, he regularly appeared as the president of KM Style, Tomáš Meduna, in the series Ošklivka Katka (Ugly Katka). On TV Prima, he also presented the Sunday prime-time programme Vím, cos dělal v pátek (I know what you did on Friday). He also often presents big social and cultural events, as well as fashion shows, trade fairs and company events. He is the author of the cult dramatised reading project LiStOVáNí. He lives in a homestead at Devět křížů (on the outskirts of Brno), and has a three-year-old daughter, Klára.